Cases like Rodney King, Oscar Grant, Eric Garner and Michael Brown have helped fuel demands for police accountability. We are joined by a guest who has advice for the growing number of people filming police abuse with their smartphones and video cameras, particularly with respect to how to properly preserve such video. Yvonne Ng is senior archivist for WITNESS, a group that trains and supports people using video in their fight for human rights. She co-authored their resource, “Activists’ Guide to Archiving Video.” Watch part two of this interview. We provide resources on how to film, like how to film during a protest, but it’s just as important to think about what you’re going to do after you film, so that what you’ve done can make the most difference it can. So, that’s really where the archiving comes in. The point of archiving is to help ensure that your video is preserved, intact and is ready to be used when you need it. So, there are a number of things that activists can do. And as you know, archiving can—when you get really into it, can get quite complex, but there’s a lot of very basic practices that anyone can do to ensure that their video survives intact and can be used. And we know that this is possible because we’ve worked with activists in Syria, who are facing enormous challenges—daily bombardment, insecurity, a lack of access to basic resources—and they have been able to successfully implement some of these practices. You want to make sure that the video documentation you have created or collected can be used for advocacy, as evidence, for education or historical memory – not just now but into the future…. But you are not sure where to begin, or you are stuck on a particular problem. If this is you, then this Guide is for you. Do you want your videos to be available in the future? Do you want your videos to serve as evidence of crimes or human rights abuses? Do you want your videos to raise awareness and educate future generations? If the answer is yes, it is important to begin thinking about archiving before it is too late. Your videos may be accidentally or deliberately deleted and lost forever. Your videos may exist somewhere, but no one can find them. Someone may find your videos, but no one can understand what they are about. Your videos cannot be sufficiently authenticated or corroborated as evidence. Your videos’ quality may become so degraded that no one can use them. Your videos may be in a format that eventually no one can play. Archiving is… a general term for the range of practices and decisions that support the long-term preservation, use, and accessibility of content with enduring value. In this Guide, our focus is on your digital videos. Archiving is … an ongoing process that begins when a video is created and continues infinitely into the future. Archiving is…a process that can be incorporated into your existing video workflows. Archiving is … a way to ensure your videos remain authentic and intact, so you can use them as evidence. Archiving is … a way to ensure your videos are available, findable and playable long into the future. Archiving is NOT… a one-time action. Archiving is NOT… putting your videos on a hard drive and leaving it on a shelf. There’s much more at the link. The above is just an intro. Today’s shave exceptionally BBS, with no sign of a nick. 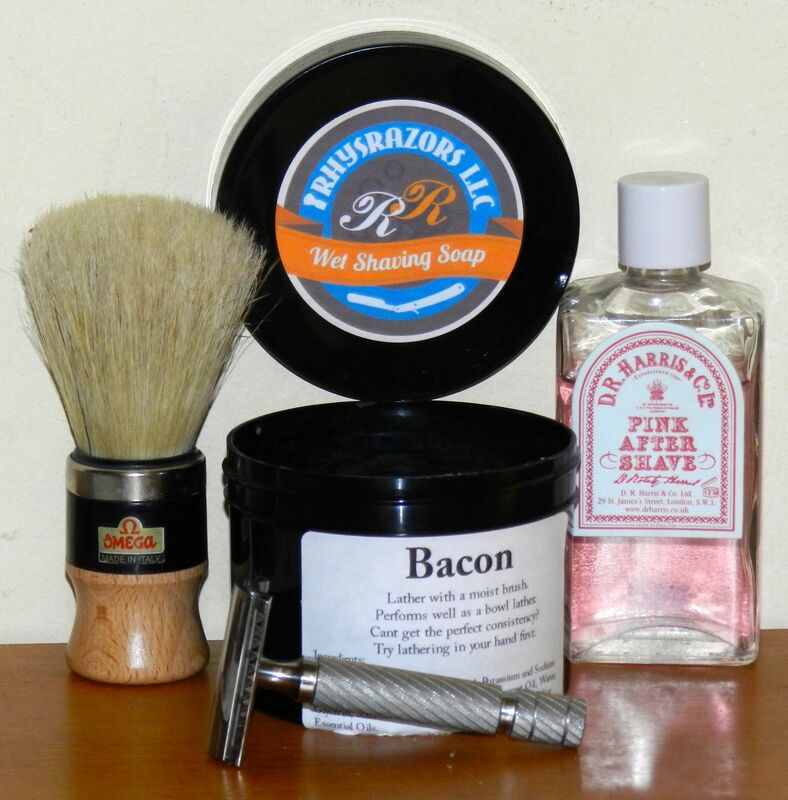 Perhaps the RhysRazors Bacon did the trick. (It’s a special scent for August, and it’s but $5/tub for a good-sized puck.) I got a good lather with my Omega 20102 boar brush, though I did have to reload for the third pass. I tend to attribute this to user error, particularly on first use of a soap. We’ll see how it goes next time. Beef Tallow, Castor Oil, Stearic Acid, Potassium and Sodium Hydroxide, Shea Butter, Mango Butter, Coconut Oil, Glycerin, Water, Sodium Lactate, Bentonite Clay, and Fragrance and/or Essential Oils. Hmm. Hadn’t noticed the Bentonite Clay. I’m beginning to suspect that clay may be at the root of some of my lathering problems: soaps with clay include Stirling, for example. This particularly UFO handle is one of my favorites, and here you see it with the Weber Polished Head, which holds an Astra Superior Platinum blade. It was a VERY comfortable shave—the Weber is definitely in the mild-aggressive category—and I would say that Standard and Weber razors are pretty much on a par, so you could get equal performance with either: choose the one you like. Three passes, a final rinse, dry, and then a good splash of D.R. Harris Pink Aftershave. It’s going to be a good weekend, I can tell. PRESCRIPTION opioid painkillers like Percocet, Vicodin and OxyContin have come under intense scrutiny in recent years because of the drastic rise in overdose deaths associated with their prolonged use. Meanwhile, access to medical marijuana has been expanding — 23 states and the District of Columbia have legalized its broad medical use — and chronic or severe pain is by far the most common condition reported among people using it. Could the availability of medical marijuana reduce the hazards of prescription painkillers? If enough people opt to treat pain with medical marijuana instead of prescription painkillers in states where this is legal, it stands to reason that states with medical marijuana laws might experience an overall decrease in opioid painkiller overdoses and deaths. To find out if this has actually happened, we and our colleagues Brendan Saloner and Chinazo Cunningham studied opioid overdose deaths in the United States from 1999 to 2010. Our findings, which were published on Monday in the journal JAMA Internal Medicine, suggest that this unexpected benefit of medical marijuana laws does exist. Pinpointing the effect of laws on health is notoriously difficult. For one thing, states that have passed medical marijuana laws are no doubt different in important ways from states that have not passed such laws. Differences in, say, social attitudes about drug use or overall health trends might affect rates of opioid painkiller deaths, independent of whether medical marijuana is legal. Furthermore, from 1999 to 2010 (the period of time we studied), states implemented various measures in response to the threat of opioid painkiller overdoses, including central registries of controlled substance prescriptions, laws allowing pharmacists to request identification before filling a prescription and laws increasing oversight of pain management clinics. These measures, too, might affect rates of opioid painkiller deaths, regardless of the legality of medical marijuana. We designed our study to allow us to compare state-level rates of opioid painkiller overdose deaths before and after the passage of medical marijuana laws, while controlling for these and other concurrent state and national trends. . . . If legalizing marijuana could save hundreds or even thousands of lives, isn’t it a moral imperative to take that step? Do those lives mean nothing? BALTIMORE — In the beginning, when they knew just where to find everyone, they pulled the children out of their classrooms. They sat in any quiet corner of the schools they could claim: the sociologists from Johns Hopkins and, one at a time, the excitable first-graders. Monica Jaundoo, whose parents never made it past the eighth grade. Danté Washington, a boy with a temper and a dad who drank too much. Ed Klein, who came from a poor white part of town where his mother sold cocaine. Later, as the children grew and dispersed, some falling out of the school system and others leaving the city behind, the conversations took place in McDonald’s, in public libraries, in living rooms or lock-ups. The children — 790 of them, representative of the Baltimore public school system’s first-grade class in 1982 — grew harder to track as the patterns among them became clearer. Over time, their lives were constrained — or cushioned — by the circumstances they were born into, by the employment and education prospects of their parents, by the addictions or job contacts that would become their economic inheritance. Johns Hopkins researchers Karl Alexander and Doris Entwisle watched as less than half of the group graduated high school on time. Before they turned 18, 40 percent of the black girls from low-income homes had given birth to their own babies. At the time of the final interviews, when the children were now adults of 28, more than 10 percent of the black men in the study were incarcerated. Twenty-six of the children, among those they could find at last count, were no longer living. A mere 4 percent of the first-graders Alexander and Entwisle had classified as the “urban disadvantaged” had by the end of the study completed the college degree that’s become more valuable than ever in the modern economy. A related reality: Just 33 of 314 had left the low-income socioeconomic status of their parents for the middle class by age 28. Today, the “kids” — as Alexander still calls them — are 37 or 38. Alexander, now 68, retired from Johns Hopkins this summer just as the final, encompassing book from the 25-year study was published. . .
And by all means, read the whole thing: it’s not just about these kids, it’s about the cultural landscape of the city: who lives on the good cultural clusters, who on the marginal, and the devastating effects of a bad cultural cluster. But of course it can be interrupted in a generation were there the will. But those who occupied privileged niches will be loath to change. Will the US be dragged into a war with Russia?! Read this and think about where it’s going. This is happening now. Russia has officially invaded the Ukraine. I hope we don’t just blunder into catastrophe à la the Great War. Isn’t this reminiscent of some bungling East-European country in the Soviet days? This is just exactly the sort of incompetence and bureaucratic bumbling to protect one’s job at all costs that you see in the early Moscow detective novels by Martin Cruz Smith. It’s the exact same thing, only different language, different time, different country. A translation, of sorts. And if the deaths in that prison are so bad, I hate to think what their lives are like. UPDATE: Soviet-style bungling seems to be fairly common. I suppose most of the time the cover-ups work. The United Nations’ Committee on the Elimination of Racial Discrimination has recently concluded its 85th Session during which time it considered seven state reports, including one on the United States. The report praised many progressive steps the U.S. has taken to ensure equality, including the termination of the National Security Entry-Exit Registration System, the adoption of the Fair Sentencing Act and the adoption of the Matthew Shepard and James Byrd, Jr. Hate Crimes Prevention Act. In a press conference convened Friday, CERD committee vice chairman Noureddine Amir highlighted the death of Ferguson teenager Michael Brown: . . .